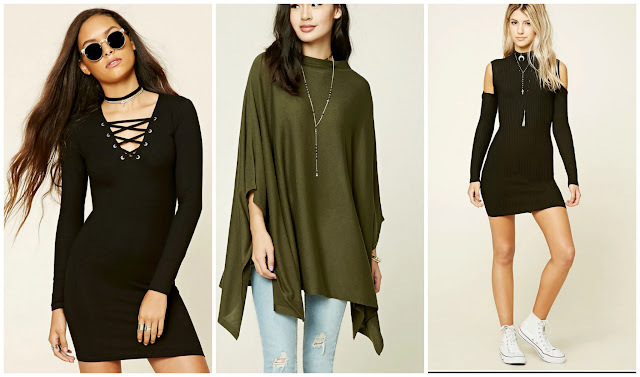 today I'm going to share what I bought at Forever21. I know, I know, another Forever21 haul. I just LOVE the dresses they sell. I first fell for the lace-up mini dress, this kind of dress is totally hot this season. I got it for €11.52. I also decided to try something new and settled for the Wool-Blend poncho for €11.52. It looks better in the picture but the material is soo nice and soft. The next dress is so nice, it's the open-shoulder bodycon dress. I got it for €17.28. I also wanted a pair of high socks in another colour than black or white, so I decided to go for the Over-the-knee socks in the colour 'Olive' for €4.32. I wanted another lace-up dress so I got the one in the colour 'Hunter green' for €13.99. When it arrived I was a bit disappointed because the material looks so much nicer than in real life. I love light pink or 'camel' coloured dresses from Forever21 so I couldn't leave the online store without one. I went for the High neck bodycon dress. I do find it a little too short and the neck is a little different than I thought. But I got it for €9.36 so it's still a steal. The last dress I but in my basket was the Scoop-back swing dress. I romanticized the 'Taupe' colour of the dress way to much so when it arrived I wasn't sure. But we all know I'm going to wear it at one point. I got the dress for €9.36.